A great look for an automotive section of your store! 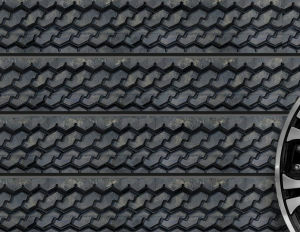 Tire Tread is a attention grabber, an a fantastic way to speed up your business by drawing your customer's attention to auto or road-based products. All 3D Textured Slatwall Panels are made from solid MDF. Panels are 2' x 8' in a horizontal configuration. All Slatwall Panels are 6" on center slats, Class C Fire rating, can hold up to 90 lbs at 6" from the wall and come with heavy duty aluminum inserts. Note: All panels are hand finished and actual color may vary slightly. This product will be shipped VIA common carrier. Freight will be quoted separately. You will be notified of the freight amount. 10 panels and under will have a $50.00 crating charge added. You can use liftgate service if needed.